Click here to access the on-line reservation site. See additional information under "Hotel Accommodations" to the right. Room block closes on 1/3/19. We have reached our registration capacity for this conference. If you would like to be added to our wait list in the event of cancellations, please email Debbie Street at dstreet@baltimorecountymd.gov. Attendance is recommended for police officers who are tasked with hostage/crisis negotiations, local police, sheriffs, district attorneys, correctional officers, officers from universities, both state and community colleges, military police units, any Federal law enforcement agency, and mental health and behavioral science personnel. Eric Maddox speaks to audiences worldwide about learning to influence and lead others through listening. Using these techniques, in 2003, Mr. Maddox collected the intelligence which led to the exact location of Saddam Hussein’s underground hideout. Since then, through many thousands of hours of experience as a 15-year veteran interrogator, Mr. Maddox has fine-tuned his ability to listen to others without common distractions, such as biases, agendas or a simple lack of interest in the other person. He discusses the method he uses and what a powerful tool it is for those who employ it. A dynamic, powerful and emotional presentation regarding the reality of the incident rate of Post Traumatic Stress Disorder within the ranks of the Law Enforcement community. Emphasis is placed on the history of PTSD, with a specific focus on police suicide, as well as recommendations for administrative training to prepare, insulate, protect, and treat the expected exposure to trauma. On March 25, 2017, a mentally ill individual boarded a regional transportation bus near the Cosmopolitan Hotel and Casino on the Las Vegas Strip. The suspect shot 2 people, killing one of them. He then remained barricaded on the double-decker bus for several hours as SWAT operators and crisis negotiators worked to resolve the situation. This incident was extremely challenging given the amount of tourists in the immediate area and the casinos being cleared out and shut down. After speaking with crisis negotiators, the suspect eventually surrendered. This presentation includes actual video and audio from the incident. In December of 2016, while investigating a shooting, Mount Vernon Police Department officers attempted contact at a residence in the area. As officers were attempting contact, shots came from the house striking one officer in the head. Shortly after, the suspect called 9-1-1 saying he had hostages, a bomb, and that he had texted the Mayor. Officers eventually learned that the suspect was a potential third-time convicted felon facing the possibility of life in prison. The negotiation team found itself communicating with someone who had little incentive to surrender, navigating the political stress of having the Mayor on-scene, contending with outside influences from the media, and working through a transition of negotiation teams. In July of 2016, police were attempted to serve an arrest warrant for a felon wanted for shooting at an Oakland Police Sergeant following a traffic crash. Before police could make entry into the home in which he was hiding, the suspect took three children hostage and barricaded himself inside. Stockton Police SWAT and CNT members responded to the scene and began negotiations. After several hours and hundreds of calls, negotiators were able to successfully retrieve two of the children from the home. This presentation will include recordings from the actual negotiation, elements of TPI use, and collaboration with neighboring agencies in a highly emotional environment. In March of 2015, this incident began as a domestic dispute between a former law enforcement officer, his estranged wife, and her boyfriend. During the dispute gunfire was exchanged, the ex-wife was struck multiple times, and was left incapacitated to the rear of the dwelling. The armed former officer, who was known to all responding officers, was under the influence and barricaded inside his house. This presentation will highlight tactical and negotiation challenges of dealing with a formerly trained officer, a victim rescue, and managing the influx of officers wanting to assist with negotiations. Registration fee includes: two full days of seminars, continental breakfast and plated lunch on both days. Registration & Payment Policy: Space is limited. Registrations will be processed on a first-come, first-served basis. Payment is due at the time of registration (check, credit card or Government Purchase Order). Registration will be closed after January 18, 2019. All attendees are requested to bring their work credentials to the seminar and have them available for inspection at check-in. As of midnight EDT on January 18, 2019, if you are registered for the conference, we incur expenses on your behalf, and full payment is expected. You are required to pay IN FULL if you are registered as of midnight EDT on January 18, 2019, whether or not you attend. If you are registered as of midnight EDT on January 18, 2019 and have not paid, you will be billed for your full conference payment. If you have paid your registration as of midnight EDT on January 18, 2019 and do not attend, NO REFUND WILL BE GIVEN. You may substitute another qualified attendee in your place without any additional fee at any time. Please contact us for assistance with substitutions. Inclement Weather Policy: Please understand that we cannot issue cancellations due to inclement weather, and we will not, under any circumstances, cancel the seminar because of inclement weather. A room block has been reserved at the Delta Hotels Baltimore Hunt Valley. Click here to access the on-line reservation site. Additionally, you can call the Delta Hotel Reservation line at 1-888-236-2427 and tell them you would like to book inside the block called: " Police Hostage Negotiation Seminar" and you will be given the group rate of $122.00 per night plus tax. BOOK BY 1/3/19 TO RECEIVE THIS SPECIAL RATE. If you have questions or problems making your reservations, you may contact the Convention Services Manager by telephone at 410-785-7000. Transportation: The nearest airport to the hotel is BWI Thurgood Marshall. Attendees are responsible for making their own transportation arrangements. Click here to download a Seminar Fact Sheet. Click here to download the list of Presentations. 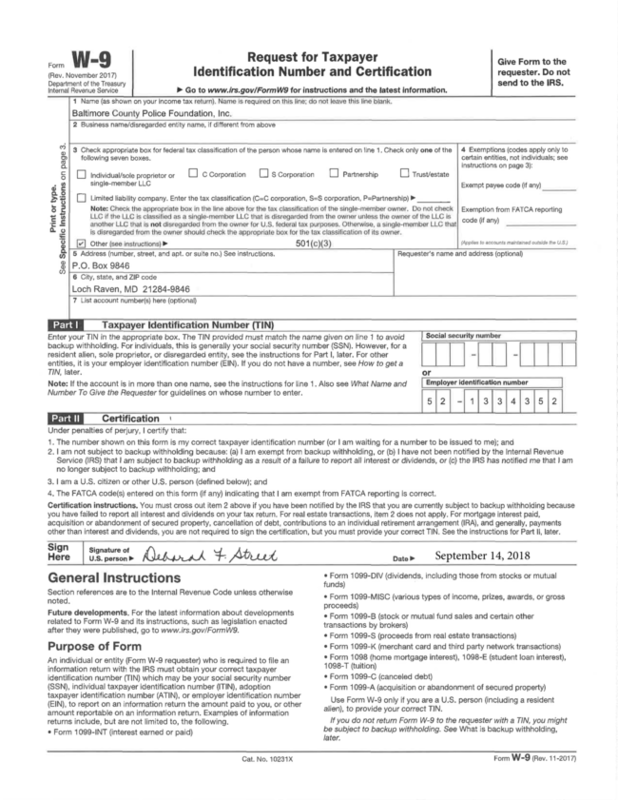 Click here to download a W-9 form for the BCPF.